This guide was created by Penn State World Campus in July 2017. It applies to Captivate 9. Content created in Adobe Captivate can be made accessible if the following procedures are followed. To ensure your Captivate project is as accessible as possible, we recommend starting from a blank template. If a template is needed, it is recommended that the template be tested for accessibility prior to customization. Any video used in an Adobe Captivate module should be captioned. depending on your resources, you may want to link to a video on a platform which supports closed captions, or you can use MovieCaptioner or another tool to "burn" open captions onto the video so that they are always visible. Follow color contrast and legibility guidelines for individual screens. Simply checking this box is not enough to make a Captivate project scenario. It just gives you access to some of the tools you need in order to do so. The following sections provide some further guidance on how to make various Captivate slide elements accessible for all users. Users who primarily use the keyboard to navigate web pages would expect that they can tab between various buttons and other interactive objects. In Captivate this is not always reliable depending on which template (if any) you use to create slides, which browser is being used, etc. These issues aside, you can specify the tab order of buttons on any slide by accessing the Tab Order… menu next to the slide’s title on the Properties tab. In addition to tabbing, there are other ways to navigate to and activate interactive objects in Captivate that are more reliable. For example, you can add keyboard shortcuts to any button. 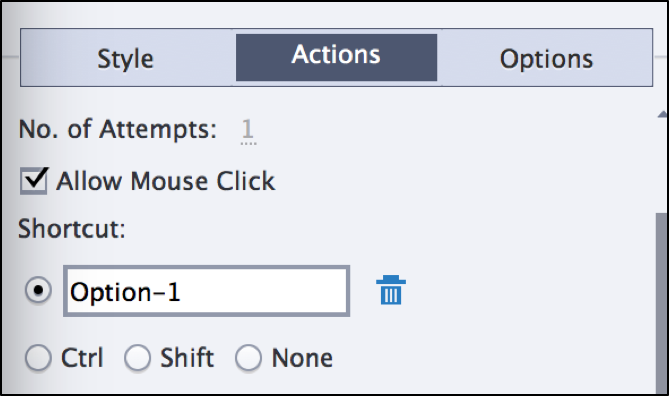 To do this, select a button, and under the Actions tab in properties select the radio button next to the Shortcut text field. Simply press any key(s) you would like to use as a shortcut. You have to be careful about which keys you use to create shortcuts because many are reserved for other uses when using a screen reader. As an example, in JAWS the numbers 1-6 are used to jump between various heading levels on a page. For this reason, it is best to use a combination like Alt+1 rather than just 1. If you are thinking about using a particular keyboard shortcut other than Alt+#, check with an accessibility consultant first to make sure it won’t interfere with any other screen reader commands. In many cases you might have a user who doesn’t use a screen reader by may still need to navigate your Captivate project with a keyboard. How will a user like this know which button is currently selected just by tabbing? You have to add visual focus to selected buttons i.e. a colored border that contrasts well with the background slide. This is just sample code that places a red border around your buttons. You can replace #FF0033 with any color you want. Just make sure it has a contrast ratio of at least 4.5:1 with any buttons and background colors. Quiz question from a nursing course. 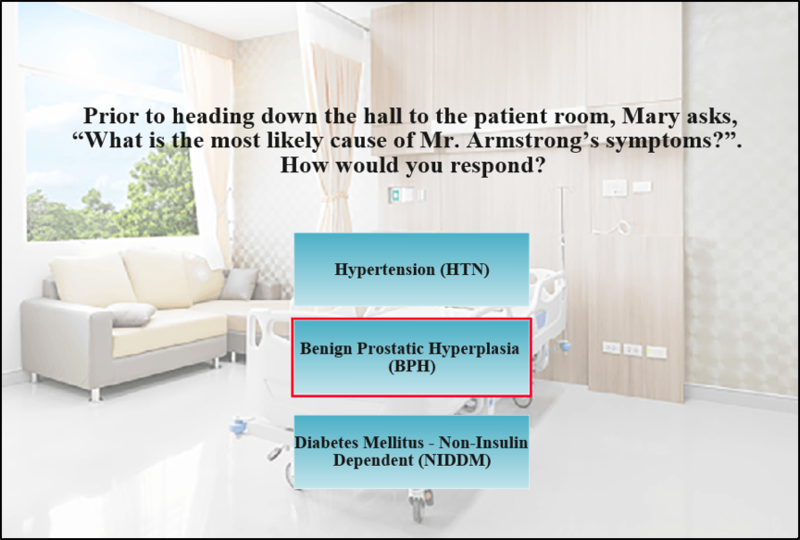 Quiz screen says Mary asks "What is the most likely cause of Mr. Armstrong’s symptoms?" Answer Benign Prostatic Hyperplasia (BPH) is outlined in red. Quiz question from a nursing course. 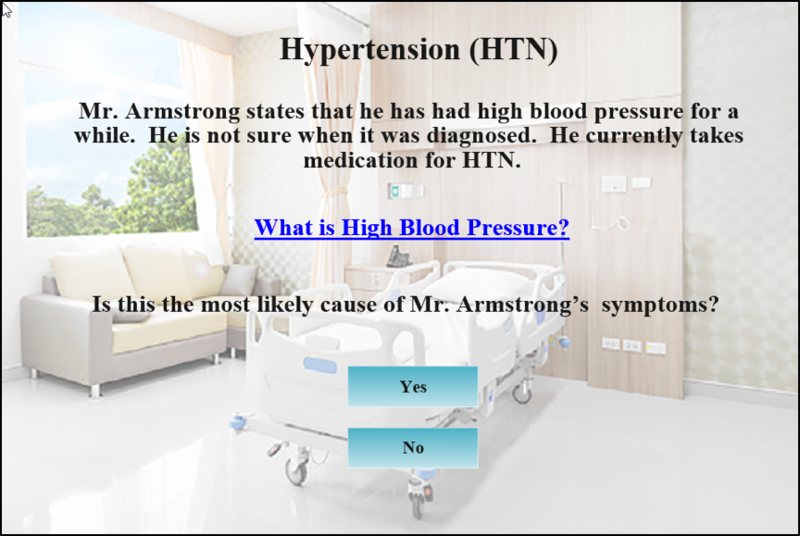 Quiz screen says: Hypertension (HTN): Mr. Armstrong states that he has had high blood pressure for a while. He is not sure when it was diagnosed. He currently takes medication for HTN. Is this the most likely cause of Mr. Armstrong’s symptoms? Buttons for Yes or No follow. Each of these text components and buttons are their own elements, and depending on how and when they were created in Captivate, they might not be read in the correct order for screen reader users. For instance, if the invisible box that contains the link was created before the box that contains the slide title, a screen reader might read the link before the title, even though that is not the order they are visually presented in. For this reason, it is important to plan your slides out ahead of time. Even if you want to add a link to a slide before you know what the title will be, create the elements in the correct order even if you leave them blank for the time being. By default, screen readers will not always read the text you may have on a slide. A screen reader user may also need additional information about buttons or images conveyed through text. To make sure a screen reader user can access all slide content, you can add an "Accessibility Name" and "Accessibility Description" to any element on a slide. Simply click the element (whether it is text, a button, an image, etc. ), and open the properties menu. Under the action tab, there is an accessibility menu option next to the element’s name. Text: Sometimes an accessibility name may not be needed for text, but it could be something like "Slide Title" or "Background Information"
Links: Should be the link text that’s on the slide with the word link add to the front of it. For example if the link is "Additional Resources", the accessibility name should be "Link Additional Resources"
There is also a field to add an Accessibility Description. 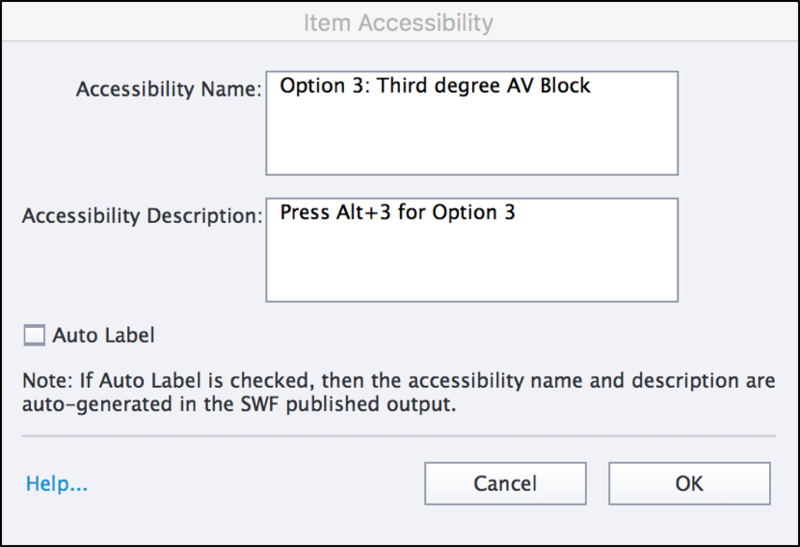 Buttons: For buttons, the description should be additional information a screen reader user would need to know, such as "Press alt+1 to activate"
In Item Accessibility, the Accessibility Name is set to Option 3: Third degree AV Block. The Accessibility Description is set to Press ALT+3 for Option 3. Auto Label is unchecked.